The Forbes digital media lab features two iMacs (3.06 Ghz Intel core 2 duo processors) a scanner, a green screen, a large flat screen tv and conference table. Please see the sections below for policies and procedures concerning use of the lab and equipment. Support & Tutorials: General Mac support and computer cluster login issues should be addressed to OIT support. The College Office provides access to online video tutorials for major applications. 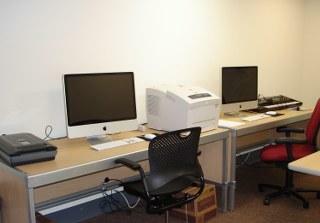 The University's New Media Center provides support and assistance in using many of the applications used in our lab. Please contact the Digital Learning Lab for information and access to software not included on the iMacs in the lab. Use of the Forbes Digital Media Lab is limited to Forbes residents, affiliates, staff, and faculty fellows who are doing work associated with the academic mission of Princeton University. University undergraduates affiliated with other residential colleges may use the lab, but priority is given to Forbes residents. Any other use of the lab requires permission, granted in writing, from the Forbes College Office. All equipment in the lab must remain in the lab and cannot be removed without the express permission of the College Office. During regular office hours (M-F 9-5) access to the lab will be provided by the College Office Staff. Permission for card access to the lab at night and during weekends can be requested from the College Office. Please come by the College Office to complete a permission form during regular office hours. Failure to abide by lab policies may result in suspension of access privileges, and/or a fee charged to your University account for maintenance/cleaning of the space. The lab should be left locked except when the College Office is open. The lab will be open for drop-in hours during the regular academic term on Thursday nights from 5 to 7 pm, hosted by members of the Forbes Student Technology Consultant (STC) staff (drop-in hours are not held during reading and exam periods). Please feel free to stop by to use the equipment, ask for assistance with a media project, or to learn more about the lab. These hours coincide with the STC office hours, so students can also bring in their devices for on-the-spot tech help. All software installed on lab computers is licensed for use on lab workstations only. This software may not be copied to disk or otherwise transferred and installed to personal computers. Software may not be installed by users (either by downloading or from external media). If you would like to use a particular software package that is not available on a lab machine, please ask the Forbes College Office. We will consult with media services and, within budgetary constrains, will seek to fulfill your requests. Installation of peer-to-peer (P2P) sharing programs such as KaZaA, Utorrent or Morpheus is expressly forbidden. Color printing in the lab for personal projects is limited to a maximum of 15 pages, per user, per term. The charge for additional printing is 25 cents per page. The color laser printer is not to be used for black and white printing that can be completed in the nearby computer clusters. The College Office cannot assume responsibility for personal items or equipment left behind or stored in the lab. All files should be backed up to personal storage space/device. Users are advised that if they choose to store personal equipment or files in the lab, they do so at their own risk. In order to ensure fair access, we reserve the right to limit use of any specific machine to two hours per day per person. Users must erase their project files from lab hard drives promptly when their work is completed. Files left on the desktop will removed immediately. We reserve the right to erase user files left on lab hard drives without prior notice if they interfere with the operation of our equipment or ability of other users to complete projects.